Christmas is the best day to stay in your pajamas all day and relax with the family. That’s why I have selected the best Christmas Movies you can watch on repeat on Christmas Day! Don’t forget the hot-cocoa! These are the classics that I grew up watching and movies the whole family will love! The holiday parties are in full swing! I always love to bring the host or hostess a little gift to thank them for their hospitality. Sometimes, depending on the type of party, I will bring a nice bottle of wine or a candle. Other times I will bring baked good or cupcakes. All of these options are great and I am sure the recipient will be grateful. 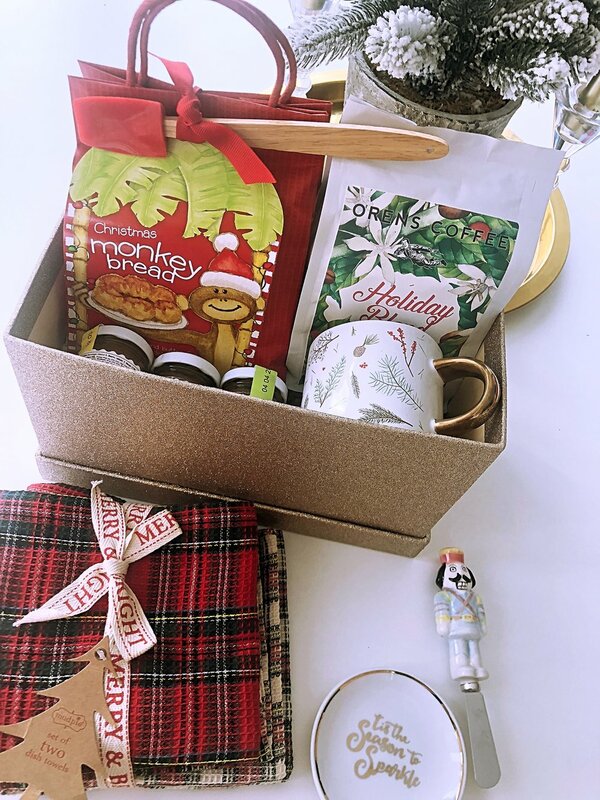 But if you REALLY want to show your appreciation, try this amazing “The Next Morning” Gift Box. I came up with this idea after realizing that many people bring wine and baked goods to events but what the host really needs is something quick and easy for the next morning! Because you know they were up late cleaning up after the party. This way, you’ve got them covered! 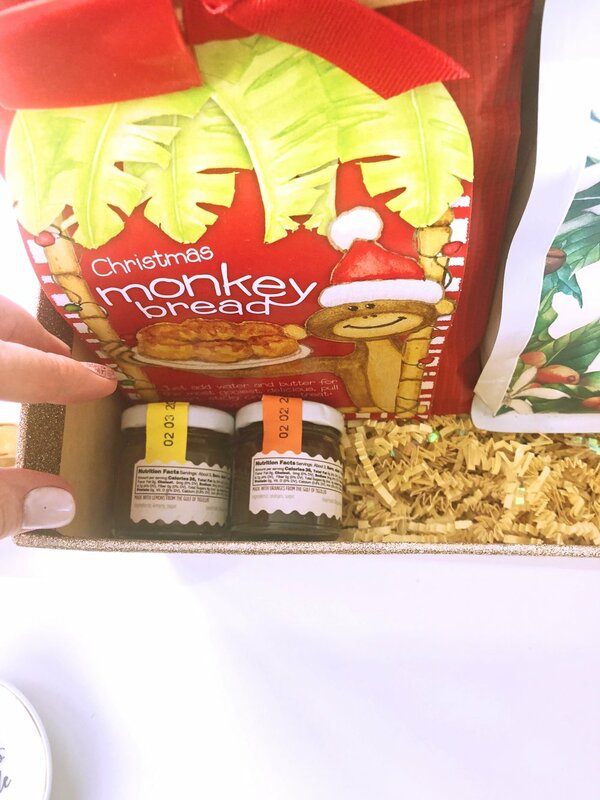 From Holiday Blend Coffee to a simple baking kit like the Monkey Bread I’ve included. Now this is a gift that they’ll appreciate! Especially if they have guests saying over, which many people do over the holidays. Then, pick up a glittery box from the craft store. Or if you can’t find one then make one from a shoe box and cover with glitter paper or wrapping paper. Fill the bottom with paper shreds or tissue paper. Then delicately place each item in the box neatly as I did to display the items but also so they say in place during transport. Make sure to hand this to the Host or Hostess like you would a cake or wine bottle as to not get misplaced with all the holiday gifts. Plus, some items may be delicate like the porcelain mug or plate. Happy Holidays, I hope you all enjoy! Kicking off the holiday season in style! I know the holidays seem far away but not to scare you, they are less than 8 weeks away… Eek! But don’t be alarmed! I have all details on how to get holiday ready. From beauty and style to decor and how to wrap and label all those gifts that you’ll be needing to whip together. So stay tuned and get your party hats on! I was so excited to attend the annual Mom Trends Holiday Soiree this year. Just the perfect way to get into the holiday sprit. With amazing drinks, food and warm and cozy ambiance from the picturesque Sugar Cane Raw Bar Grill in Dumbo, Brooklyn. This stunning waterfront restaurant offers views for days with the New York City skyline as the backdrop and spectacular views of the Brooklyn and Manhattan Bridges. 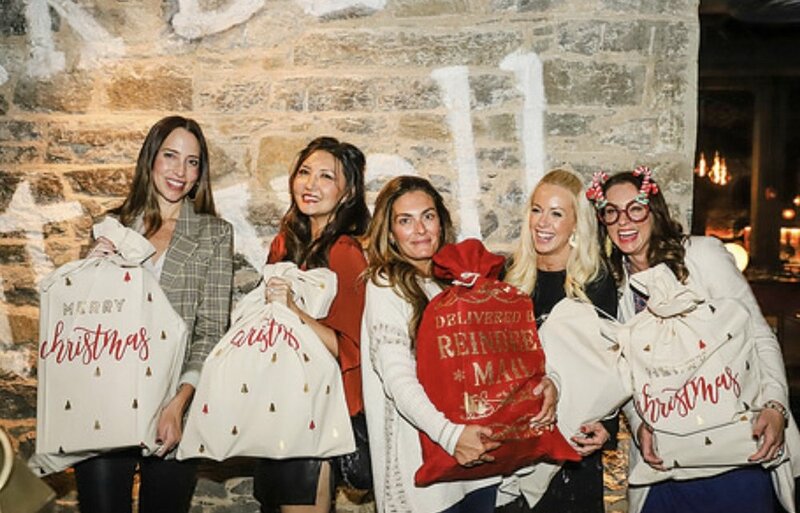 Plus all my favorite mom bloggers were there to get the holiday vibes flowing. We tried all the latest menu options from savory dishes like the memorable sweet potato dish with maple soy, brown butter crumble and even little marshmallows (pic below!) but my favorite dish of the night was the Torrejas which is dulce de leche soaked french toast, maple caramelized apples, cinnamon ice cream. YUM! But first there was GLAM! No soiree would be complete without all the beauty and glam am I right?! So I hailed the closet taxi and headed to the Tribeca location of Glam & Go, right in my neighborhood. This luxury hair salon is known for it’s fast services. Perfect for this mom on the go… I know you all can relate! With their popular 30 min blowouts, I may actually be able to squeeze this into my daily routine! But today I opted for the 15 express service which touches up blowouts without wash and dry. Ok, even the busiest mom can find 15 minutes! This popular salon is popping up all over the US, with locations in NY, Miami, LA and now Washington DC. with membership options available. Once my locks were under control, I had to get the nails to match, of course. I desperately needed a manicure and GlossLab wowed me with their clean and efficient salon. The completely waterless salon offers the highest level of hygiene. They scrub and steralize every tool and no files and buffers are used twice. Plus they offer vegan polish without parabans and 9 other ingredients I am pretty sure we don’t want on our bodies. 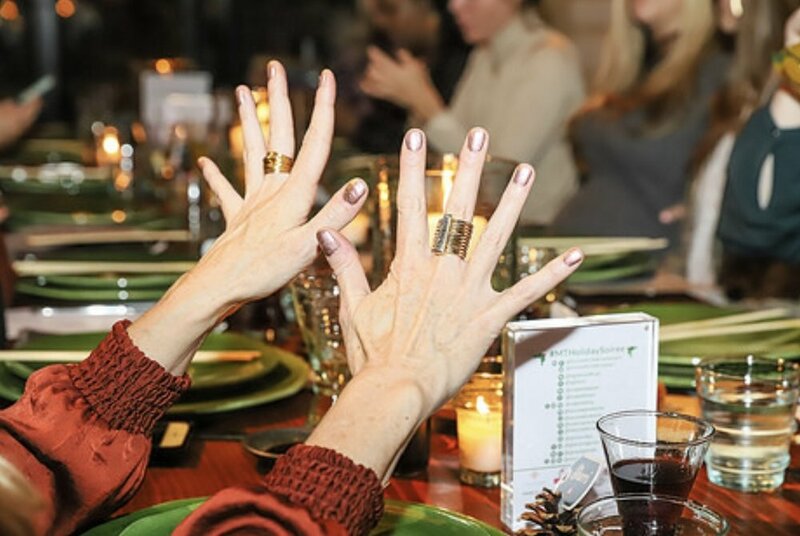 GlossLab has a unique monthly unlimited membership so you can get that midweek mani guilt free! Perfect for all those holiday parties you'll be attending. 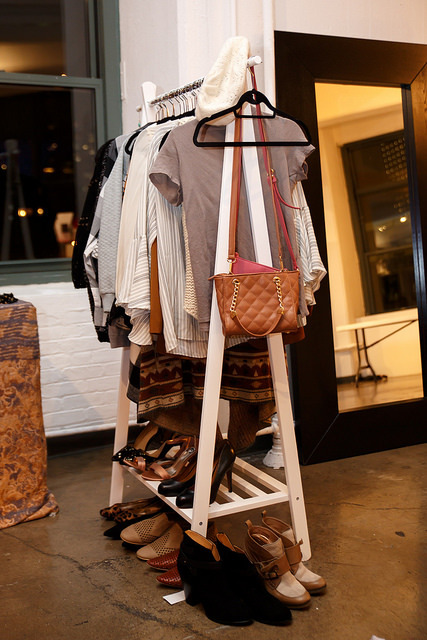 The glam session didn’t end there ladies… Now what to wear?!! I love pieces that can be worn over and over again. That is why I chose this gorgeous sweater by Cabi. They have reinvented the way woman from all over the country are shopping. Plus, their new line is so great for mixing and matching with pieces perfect for work or play! And today… to Party! I layered the Cabi Crop sweater over my sparkling dress for a fun night out on the town. Choose the styles that work best for you and your wardrobe. But no outfit is compete without the accessories! Marcia Moran is a great brand to add that final touch to any look. These gorgeous and super light weight earrings were the perfect pop to my evening look. From fashion forward designs for all you fashionistas, there is a piece for everyone. Maybe you need that special gift for that certain someone well, Marcia Marce are perfectly priced to help you check off some items off your shopping list. Now let the party begin! Santa came early and I wasn’t complaining. All the momma’s were treated to some pretty awesome gifts this year. And ones that will come in handy as we are knee deep in the holiday to-do lists. I needed some help getting my head around all the wrapping and hosting I’ll be doing and thanks to Mabel's Labels I won’t have to worry about anything getting misplaced or confused. With three kids, these labels are the perfect idea. Plus the kids won’t be wondering why Santa’s handwriting looks familiar (wink wink)! But the best were the pre-printed address labels they made for me. I know I’ll be using these for the annual Christmas cards. 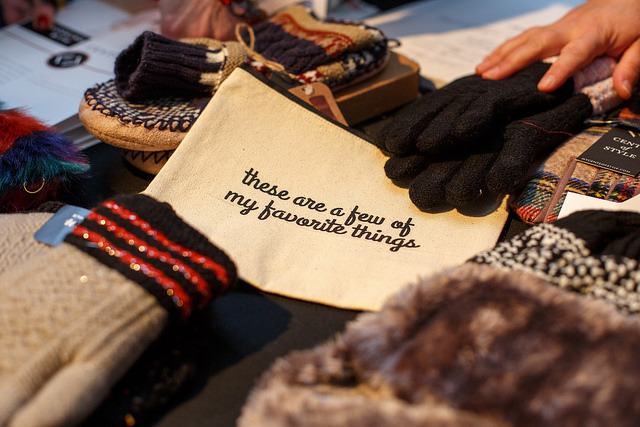 These are the perfect way to add a personalized touch to your holidays. Get gift wrapping under control and wow your friends and family with these beautiful gift bags from Eo Creative Works. What I love most about these bags are they are reusable. No need for that giant garbage bag to fill with all that expensive wrapping paper just to get tossed away. Plus I love all the fun holiday motifs. It’s the small personal touches that make the holidays feel so special. Need the perfect gift or maybe searching for a fun way to dress up your table decor for that family dinner you are hosting? You must check out Tighemi. These are truly a work of art with Moroccan-Artisan inspired collection. The handblown looking wine glasses were my favorite as they are so uniquely designed and have such an elegant yet rustic warm look. Can you say hostess gift?!! With so many great ideas, I feel ready to tackle this Holiday Season with style and grace! Wishing all of you a happy and stress-free 8 weeks ahead. We can do this! This is a sponsored post but all thoughts and comments are my own. For another post like this from Stylishly Stella click here. 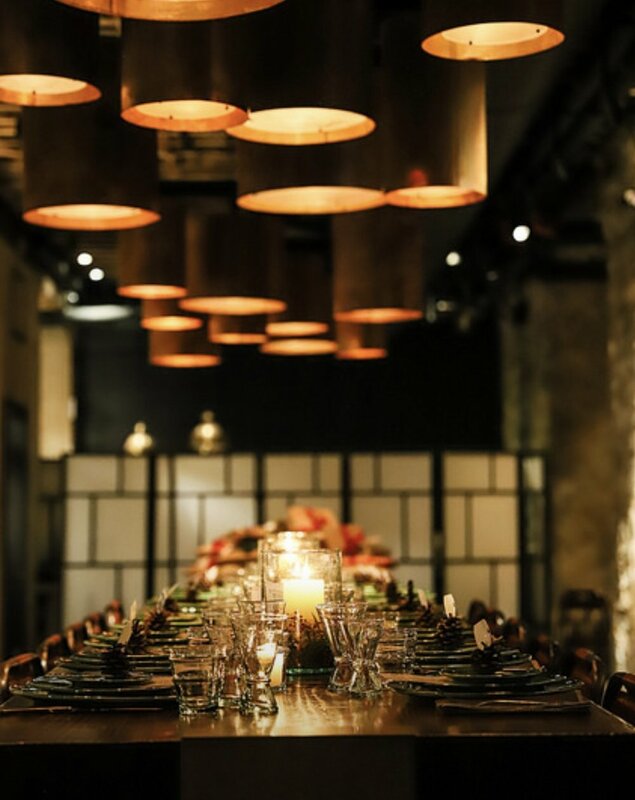 Hosting a few friends for an intimate dinner? Or just want to make a nice family dinner for the family… here is a super delicious, quick and easy fall inspired menu that will have everyone asking for seconds. Fall is here but the weather is still saying its summer! Here is perfect menu to introduced you back into the Fall flavors. I always love a good charcuterie board! 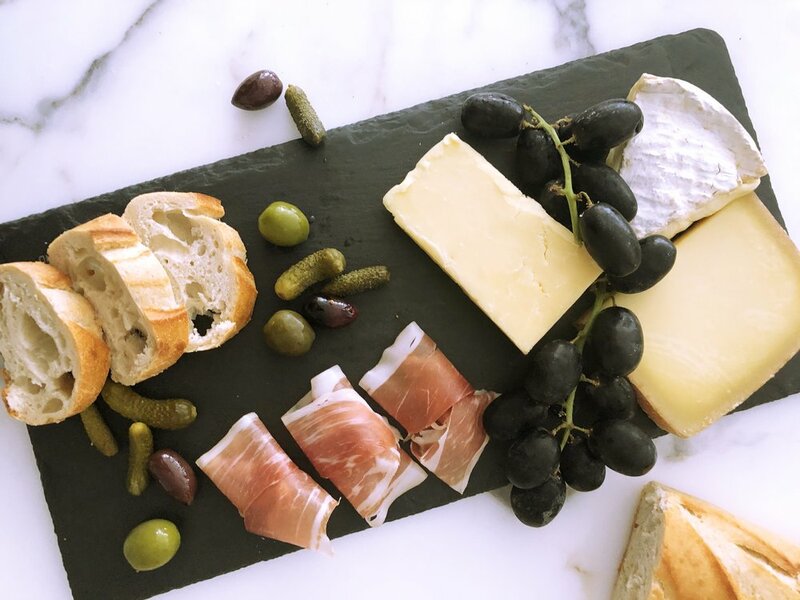 We call it our “spread”… and I always put one together when we are hosting friends or family. It consists of either crackers or sliced baguette with a nice thinly sliced cured meet. My husband and I both love speck but you can definitely do the typical prosciutto. Then I add a couple branches of seasonal grapes and an assortment of cheeses.. My favorites are always an aged cloth bound cheddar (hard cheese), a nutty gouda with the crunchies in it! (which is actually just calcium lactate crystals) but we love them… and a nice softer cheese for example a goat cheese or brie. To top off my “spread” I always add a salty cornichon which is just a fancy way to say tiny pickle and some delicious Italian olives. Although I like most olives so any will do! This pairs well with most cocktails. Most guests will love a glass of wine but to make the evening special I try to always add a specialty cocktail. And this season I am just obsessed with anything blood orange. It started when I had my first blood orange margarita and I just love playing with that delicious flavor. So I tried the blood orange gin by Malfy and mixed up the perfect vibrantly colored cocktail. To add a super “Fall” flavor I added a few grates of a fresh cinnamon stick. 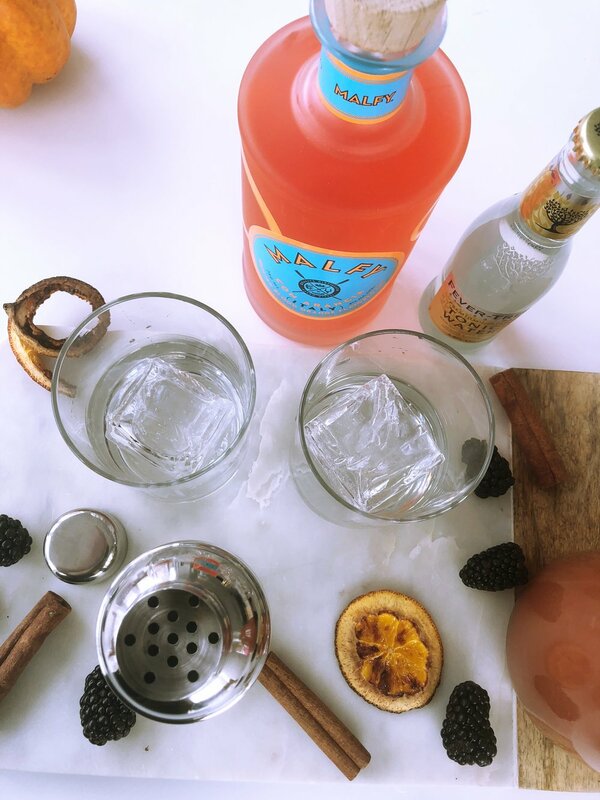 Then top if off with a crisp refreshing tonic, a splash of blood orange juice for sweetness and there you have it! 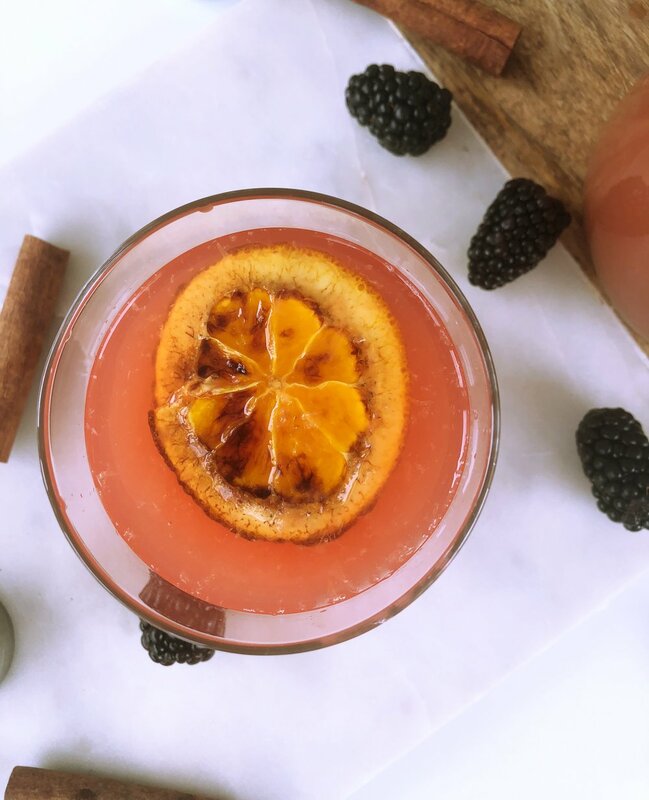 Garnish with a thinly sliced blood orange if you are really looking to wow your guests! Once everyone is ready for dinner I love doing family style... Large plates or bowls placed all over the table and everyone can help themselves. I love the vibe of a casual dining experience and want everyone to enjoy themselves! My husband is the foodie in our family and he’s been really into adding peaches to our salads. I love this idea because it’s so delicious and so unexpected. Get a nice bunch of mixed greens, add a few cut up pieces of peaches and mix up a light vinaigrette (my favorite is equal parts balsamic vinegar and olive oil, harty pinch of salt & pepper and little pinch of mustard powder).. simple and super yummy! For the main dish, one of my favorite dishes, Sage Butter Pasta. I love getting a fun colorful batch of pasta from the gourmet market. I don’t buy this often but everyone in my house gets excited about it and just having the best ingredients makes all the difference. But the butter sauce will be the best part! Add 1/2 stick of butter (we’ve been using this farm bought fresh butter and just love it, but any butter will do) and handful of sage (fresh herbs ONLY!!) to a medium sized sauce pan over medium heat. Cook this down until the sage begins to look darker and crisp… The butter should be a beautiful light brown color. Combine with pasta and finish by topping it off with some fresh grated parmesan. Whats better than a nice bowl of fresh berries. We alway mix strawberries, blueberries and a few delicious blackberries. But to make this super special try adding peaches and a lovely coating of sabayon. Ugh, this is my favorite and it’s actually so simple to make! Here is our recipe… 7 egg yokes, half teaspoon of vanilla extract, 1 cup of sugar, tablespoon of amaretto liquor and wisk for 11 minutes using a double burner. Voila!! Happy Eating!! Please share your favorite fall recipes below! 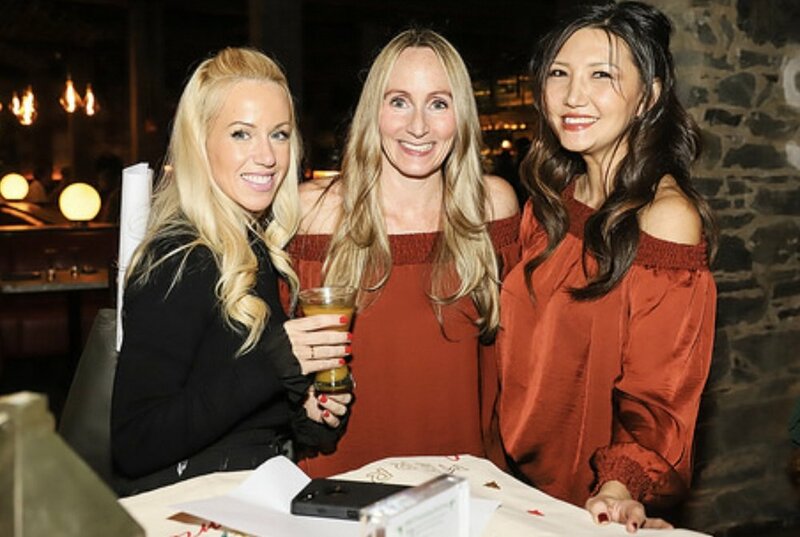 What better way to kick off this holiday season than with all the fun at Mom Trends Holiday Soiree. I was so honored to be invited to this year's super festive event! And it did not disappoint! So many great brands Pearhead, Red Velvet NYC, O-Venture, Riders by Lee, maniorpedi, My Cents of Style, Boxed Water, Jarlsberg, Noble Vines, AtMos FX. There was fashion, food and did I mention wine? Well, yes, there was so much to discover. 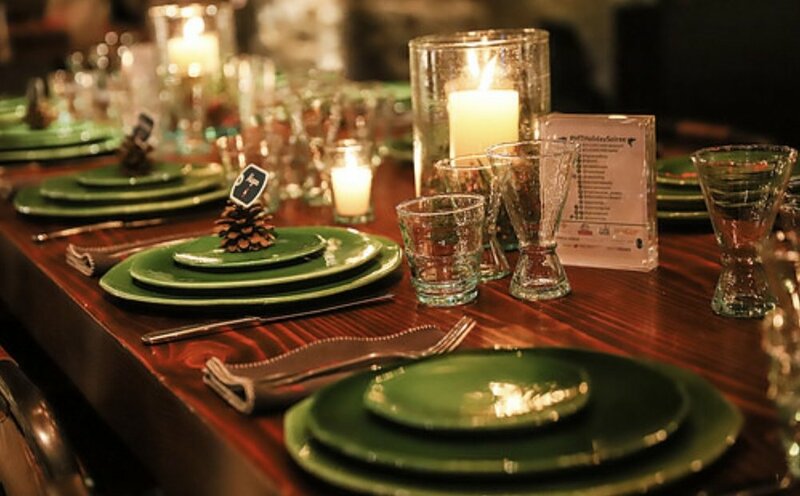 Bloggers were challenged to mix and mingle like pro's with DIY's and decorating at every table. The beautiful space at Splashlight Studios was transformed into a winter wonderland with a gorgeous display of holiday images from Santa and Rudolf to snow falling and twinkling lights. 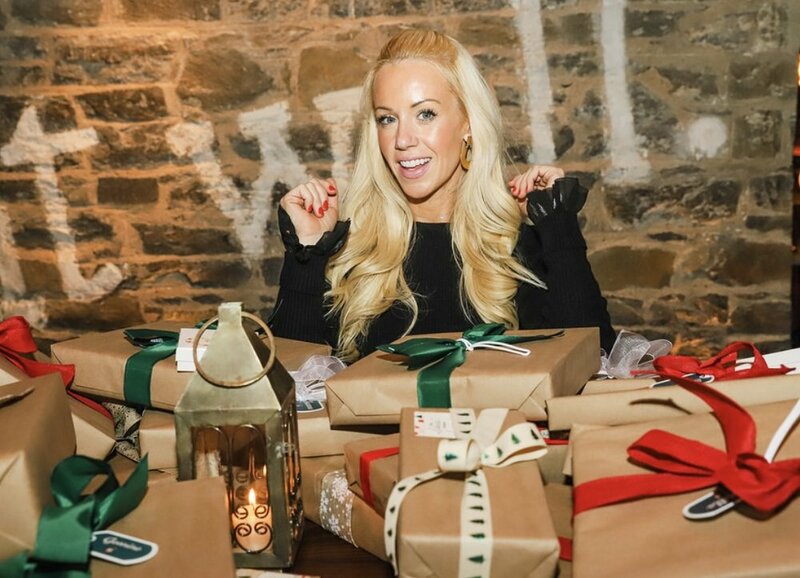 The ambiance was magical and it immediately took my mind straight to all the holiday parties, entertaining and of course the gifts! The first station was for us busy moms on the go. No time to get your nails all glammed up with that oh so perfect holiday shade of red? No problem, maniorpedi can come to you! Your office or home can be taken over by the talented team for that perfect manicure to wear all season long. I know I'll be needing this for sure this hectic holiday season. With a big extended family and my own 3 kids to shop for, it leaves little time for me. Thanks to Mani Or Pedi I won't need to worry about feeling put together at all the holiday gatherings. All of us need to stay hydrated in this race to accomplish it all. Shopping, wrapping, cooking.. it could leave us all a little worn out. 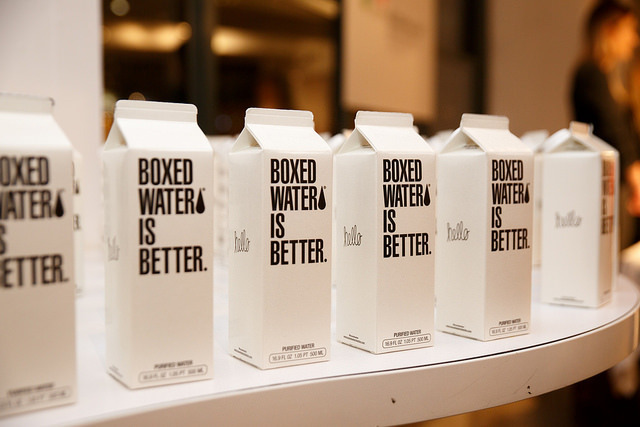 No problem, because Boxed Water has us covered with this unique water bottle in a box. Your kids will love it too and who does't want to be environmentally friendly this season and all year long? This brand helps by using sustainable materials so you can have your H2O on the go! 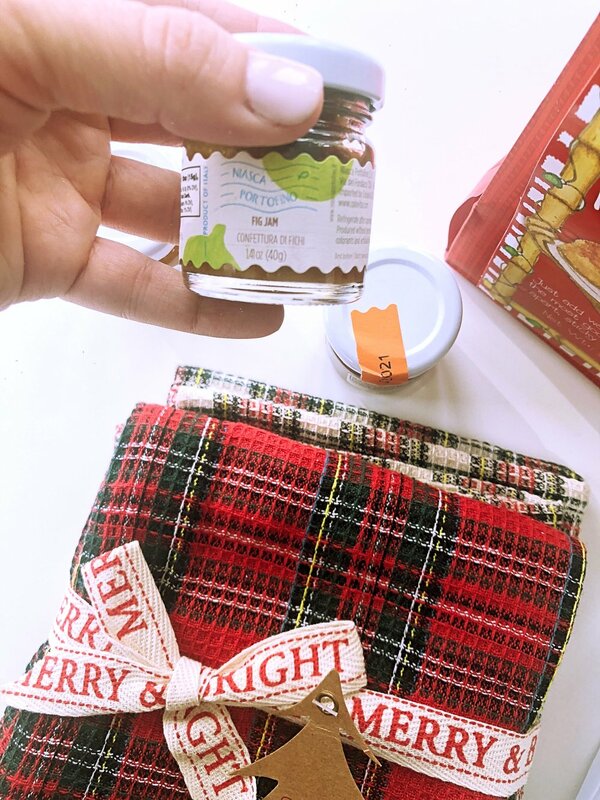 Do you love to make your own seasonal gifts? I do too! 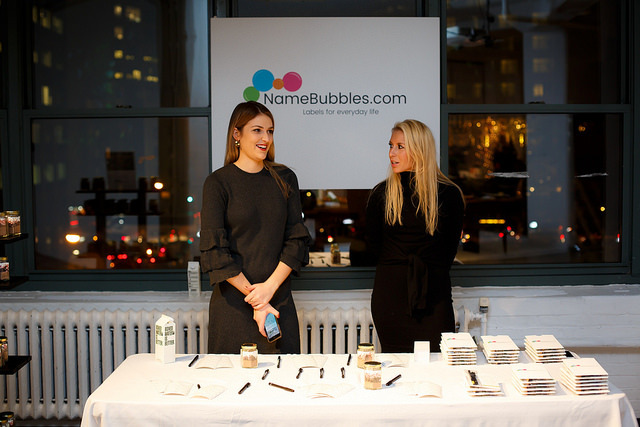 And that's why Name Bubbles labels are perfect to have on hand this season. I love personalizing everything and who doesn't want to receive a gift that comes from the heart! This brand let us special make labels for their very own make your own hot cocoa mason jars! I may need to steal this adorable idea!! Thanks, guys! Time to talk fashion... We all have many events to attend and Riders by Lee really put us to work styling their jeans into the perfect outfit for every occasion! From office work parties to girls nights out, the bloggers had a rack full of accessories and I have to say this bunch knows how to dress! Guests were also treated to a fashion show featuring the amazing fits from the brand. How fabulous is that?! We sure worked up an appetite as we made our way to the next table filled with the most decadent array of cheeses by Jarlsberg. Here we were challenged to make our own cheese plate. Entertaining this season? Me too! I know I will use this idea for my next holiday gathering. It is the perfect pairing for a festive holiday get together. Have little ones at home and want to capture this year to enjoy every year to come? Well, Pearhead has come up with the most adorable ways to do that! Each blogger was gifted their choice the cutest, sweeties gifts from items like baby's first Christmas to make your own ornaments. Then the team gift wrapped it like the perfect Christmas elves. Each piece they had was special and I wanted them all! But I choose a holiday picture frame that I can't wait to fill with a family photo from this year. To capture this time and remember it forever. They have the perfect gift giving options and stocking stuffers. You must check them out! Have a sweet tooth? Yes!! I do! Well, the holidays just wouldn't be the same without some yummy desserts. Red Velvet NYC has created the ultimate gift box. They have taken all the hard work out of baking delicious treats. 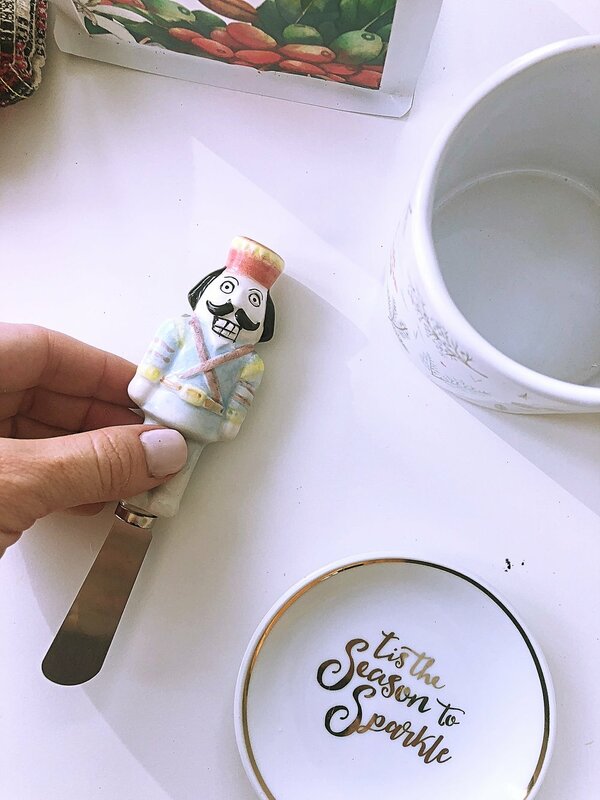 From their iconic red velvet cupcake box to their new seasonal gingerbread cookie box, this company is my new go-to! Each ingredient needed is provided in the exact portion required. And if you have ever attempted gingerbread cookie making you would know that there are tons of ingredients! No worry, Red Velvet NYC boxes can be shipped and delivered right to your door; or sent to friends and family. They currently ship to many other states in the US! How exciting! Need to look fabulous without breaking the bank well My Cents of Style will handle all your needs. I fell in love with this brand. They empower woman and leave us not only looking great but feeling great. I am not only saying that because they gifted us with the coziest blanket scarf wither. I absolutely loved the looks that Nicole and Sherri were wearing. Little did I know they both had on looks from My Cents of Style. Thanks for the fashion inspirations ladies! You both looked fabulous. With all the decorating, shopping and holiday madness I am sure you will all be running from place to place carrying tons of bags and boxes. Can't keep track of your keys? No problem. O-Venture has the solution for all us busy moms! Keeping your keys close and not lost at the bottom of your giant mom bag is so just practical; I have to say I love this! So does Oprah! And who says a practical mom can't look fabulous doing it all! This beautifully leather bound bracelet comes with a small metal clasp to keep keys right were you need them... On your wrist! They have so many color options.. I picked a gorgeous rose gold metallic leather one that I can't wait to use. I also love the idea of attaching a small clutch or makeup bag too. Something to hold just my phone, chapstick and credit card. The necessities when you are on the go! No holiday gathering is complete without a perfect glass of wine to help get you in the spirit! 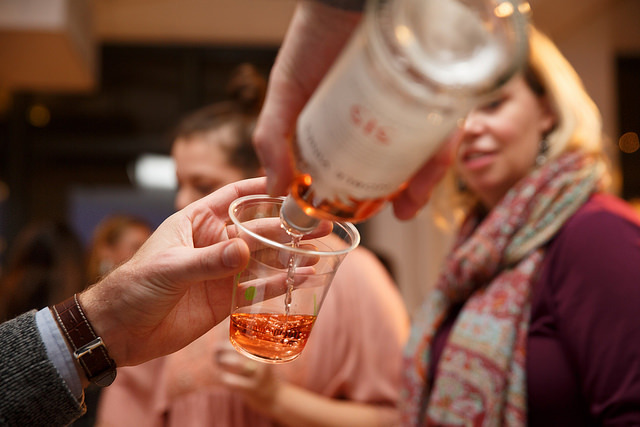 Noble Vines made sure to supply the event with the best selection of their delicious and affordable wines. The influences were lucky enough to try a few of their most popular. My favorite the chilled Rose'. Well, if that wasn't enough each blogger went home with an other amazing gift bag... or should I say stocking! I loved speaking to all the incredible brands! It really got me into the holiday spirit of gift giving! I love giving back and Mom Trends does too. Each blogger brought a toy to donate to Second Chance Toys which specializes in keeping plastic out of landfills and donating toys to kids in need. Whether you are planning a baby shower for one of your oldest friends or need that iconic first birthday invite for your little one, Basic Invite gives you the tools to highlight the importance of that day your way. I have planned so many parties and it always starts with the way the invitation looks. It really sets the mood and the theme for the event. Normally, I go online and browse around all the pre-fab invites that cater to that specific party theme. Searching things like "boy baby shower" or "girls princess party" and I see what the various sites have to offer. Sometimes I find something that works with my theme and colors but most of the time I settle on what is available. But with Basic Invite you don't have to settle anymore. I love being creative and now I get to do that and make the invite the exact way I want it. The best part is the you get to see just how the invite will look so you can play around with the background and font colors as much as you'd like until you find the perfect match. They even let you order just ONE copy of it so make sure it is exactly what you envisioned. It really is easy and takes very little time. Even if you don't know exactly what you want going into it, you'll love exploring the options that they have for you to choose from. Even allowing you to change the color of the envelope. I just love that feature! See how I changed the original dark grey option they have and made it go with a pale pink and grey color scheme! They also have many colors and options to choose from so you can customize it as much or as little as you need. Plus, the prices are great!! A win, win! When a generic party invite just wouldn't cut it, try Basic Invite for your next gathering. Check out these amazing card ideas! They are so cute, don't you think?! This is a sponsored post but all opinions are my own! What better way to get in the Valentine's Day mood, than sipping champagne and mingling with your girlfriends for a fun do-it-yourself candle making bash?! This past week, one of my good friends and fellow DIY'er Melanie, owner of Petit Elephant NYC, and I hosted a fabulous and over the top Valentine's Day themed event. The ladies were treated to a delicious champagne punch with strawberry and raspberry infused ice cubes, a chocolate fountain and of course champagne jello shots in the shape of hearts. 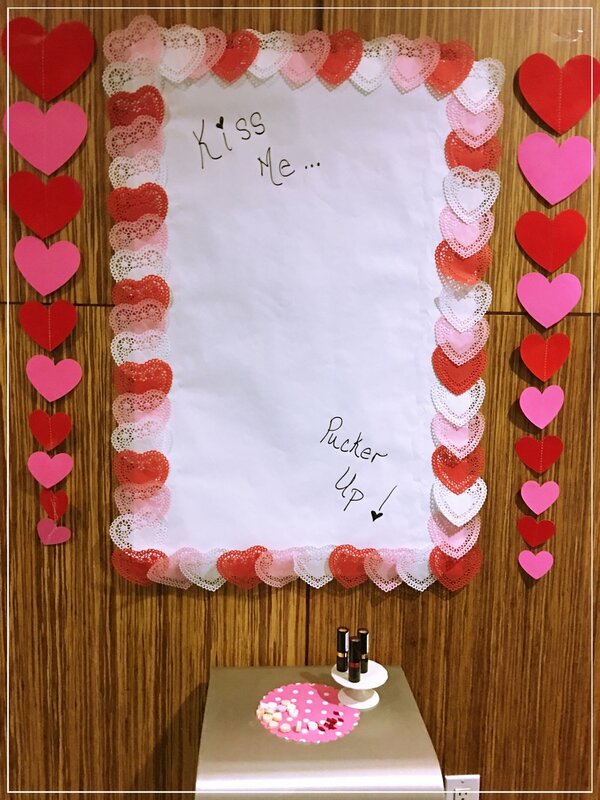 Some of the event features were a "Kiss Me Wall", photo booth using the InstaX Mini 8 camera for instant pictures as well as adorable Valentine's Day Themed props! An incredible raffle sponsored by Glam Squad which is having a special promo right now $25 off your first booking using code GLAMLOVE25, Jeff Lake Camp, Current Fitness, CleoNYC Chloe and Isabel and of course Petit Elephant! However, the biggest focus of the night was on the fun DIY craft that I put together; candle making! I created two super sentual choice for the ladies to choose from. The first scent was a mix of citrus notes and was cleverly called Love Spell, the second option was a seductive sweet chocolate scent. I used essential oils that are safe for the skin. The candle wax is made from all natural soy and can be used as massage oil when melted. How perfect, right?! First, the ladies decorated their candle tin with crystals and personal touches that Melanie and I carefully arranged at each place setting including labels that they could write a personal message on, or simply a "Made With Love" label. I then went around the tables and taught the ladies one-on-one, how to set up the candle wick to get it ready for the wax to be poured. Once they completed this, they came to the kitchen where I had the hot candle wax in the two enticing scents. I explained to our guests, as they decided over their scents, how the wax is melted and what it looks like pre-heated. I explained how I prefer to use soy wax chips because I like the way they melt quickly and it makes my job super easy! I stressed the importance of safety during candle making through-out the demo. I used a double boiler to prevent over-heating the wax which could catch on fire if left over direct heat. I also, showed them how I used a thermometer to monitor the heat of the wax. The wax should always be poured at a temperature of approximately 130-150 degrees. I love crafting, but not everyone shares this same interest. Seeing the look of joy and accomplishment on their faces when there were done is so empowering. I love showing how easy many DIY projects can be, and also how fun! The night finished with our lucky raffle winners being chosen. However, no one went home empty handed along with their DIY candle, the woman personally selected a piece of lingerie from the La Mariee Lingerie Sample sale. For more information on this event, please contact me or leave a comment below. 1- Entertaining for all ages: Make sure you have food items that will cater to all ages, along with the old family recipes or pot luck foods, prepare food that picky eaters will enjoy as well; like chicken fingers, pasta. It's always fun to introduce traditional family recipes to the kids but sometimes it's hard to make sure they've eaten enough at large family parties. Especially with all the sweets around. Joanna recommends checking to make sure there are no food allergies. This will show you really took the time to consider everyone! 3- Family Christmas Stories- This is something everyone will enjoy, not just the kids! Have everyone write their favorite family christmas or holiday story on a paper and put in a center bowl. Then as the dinner goes on you can take turns pulling out a paper and reading the story. This is a fun way to share memories and walk down memory lane. The kids will love hearing all the stories!! 4- Hot Cocoa Station- Make a DIY hot chocolate station for the kids (adults will love this too!) Prepare hot cocoa and put in a warming pitcher.. check out this one from Greville. Then, have marshmallows, cinnamon, whipped cream and candy canes on the table so your guests can make it their way! To avoid spills you can buy the to-go coffee cups like these from Bed Bath and Beyond by Dixie. For adults you can also provide rum or try this recipe from Baileys that is a favorite in my family, Baileys Irish Cream Recipe. Not huge hot chocolate lovers? Well, Joanna always serves a drink called Scropino. It's Prosecco, a splash of vodka and a scoop of lemon sorbet! "Add a sprig of rosemary to make it festive" says Joanna. For the kids, try sparkling water and a scoop of lemon sorbet. 5. Seasonal Produce- Joanna recommends making the most of seasonal items. Shop the local market and find out what is only available during the holidays. It's a fun way to try new recipes and the seasonal produce is always fresher and riper. Her kids love the Cotton Candy Grapes that actual taste like cotton candy. Amazing, right?! But for adults try something like this amazing lettuce that is only available during certain months of the year. See more benefits to buying seasonally! Every time I have dinner at their apartment, I leave always wanting to know how she pulled that off! Two busy kids, two dogs and she still manages to make the most delicious meals and have fresh flowers!! So, for all of you out there wondering the same thing, I've asked her how she does it; make my mouth drop and water all at the same time. Here's how she likes to make a lasting impression.. as if her cooking isn't enough! 4 large bone in and skin on organic chicken breasts cut each breast in half so that you have 8 pieces. Start by either in a food processor or chopping by hand, the garlic and the herbs. Add in the lemon pepper seasoning, fresh lemon zest, olive oil , a squeeze of one whole lemon and plenty of salt. In a large skillet such as a cast iron, add a little olive oil to the pan on medium high, wait for pan to get nice and hot, arrange your chicken pieces skin side down. Put another heavier pot directly on top of the chicken so that it is pressed down. Be patient and let the chicken get lots of color before turning. This should take about 8 min. Once the chicken is very brown and crispy turn over and press again but only for about 4 min. Add Potatoes and shallots to the pan season with salt and pepper. Cook on medium high heat until potatoes and shallots are caramelized. Add the thawed artichoke hearts and cook for a few more min. Squeeze the juice of one whole lemon on the potato mixture. Add the Chicken and Juices to the pan and put into the oven for about 25 min. Until the potatoes are tender. Check out our Featured Mom, Joanna Moeller's, at home version of Italian Wedding Soup. There is something in this dish everyone in the family will enjoy. I know it looks so hard... but here is how she does it! It's so simple. See how she breaks down each step. This is a wonderful and easy soup recipe that both children and grown ups love. It's great for a week night dinner or also to serve for guests. Start by making your meatball mixture. Brown in batches in a heavy bottom pot such as a Dutch oven or any soup pot is fine. Set aside browned meatballs. Sauté for about 2 min. Summer for about 20 Min. Add pasta directly to pot and cook for another 8 min. Brinkley's and Brent's birthdays are in the same week. I debated having two separate parties but realized that it would be best for everyone if I combined them... I mean come on! Who wants to throw two parties within a week of each other? And also make our friends and family come back twice. Well anyway... I did decide to have my daughters 6th birthday together with my baby's 1st birthday. The venue was easy... it's the public space in our high rise building called The Lounge. It's on the 7th floor right off the indoor pool and gym. And features a private terrace, kitchen, fireplace and pool table. I've actually thrown all the children's 1st birthdays here and was pretty excited to be following in tradition for our newest addition. So we called our favorite cake decorator and let the planning begin! Chic Sugar is an amazing cake decorating company. We meet almost 8 years ago when we called her to do Brycen's 1st birthday cake. She also did Brinkley's cake one year and has done them for other birthdays here and there. We knew she'd be able to pull off a "Shimmer and Shine" cake for Brinkley and also replicate the same "BMW" car cake that she made for Brycen, for Brent! Some how in all the talks we collaborated on the idea of her doing cake decorating for the kids and my daughter couldn't be happier! She loves anything sweet and is so into baking and decorating that this was her dream birthday party. And Chic Sugars did not disappoint. She surpassed my wildest dreams and came with boxes and bags full of stencils and molds.. every color in the rainbow colored cakes and fondant for the kids. The decorating table was swarmed with children of all ages just antsy to get their hands dirty! I love cake decorating myself and was seriously jeleous i couldn't get in on the action. But Brent was a little too young for this and we had a music class on the other side of the room for the babies. 1. Pick a movie everyone will enjoy - If this becomes a battle amongst the kids try picking a few choices and then rotating who chooses or having them choose together earlier that day so they aren't fighting over the movie right before you are ready to start. 2. Try the classics - Show them movies that you loved as a child! 3. Set the stage - Make the atmosphere conducive to watching a movie. Make it special and fun! Try getting extra large pillows and blankets so everyone can cuddle up and enjoy! 4. Popcorn, candy and drinks - We always have popcorn, candy and drinks which makes it feel like a real movie. See my post under DIY popcorn party for tips on candy for the kids! 5. Make it a bonding experience - Who does't love to cuddle with the kids. Make it a special and memorable time. It's not just movie night; its a time you are all together relaxing as a family. And thats pretty cool. 1. Try not to pick movies that may bore the kids. If they lose interest, movie night is over :( So let them weigh in. 2. Don't expect the kids to sit and watch a movie if they have been in all day. Try getting them out for a long walk or park time before the movie so they are eager to sit and relax. 3. Candy- Giving the kids too much candy at night can be bad for everyone. The sugar rush won't help the littles sit still either. I'm not saying don't offer candy but just be aware of how much they consume! !